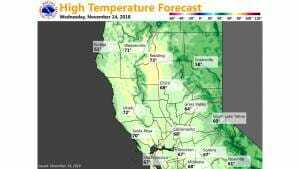 November 14, 2018 – Dry weather with cool nights and above average high temperatures continues through the week. 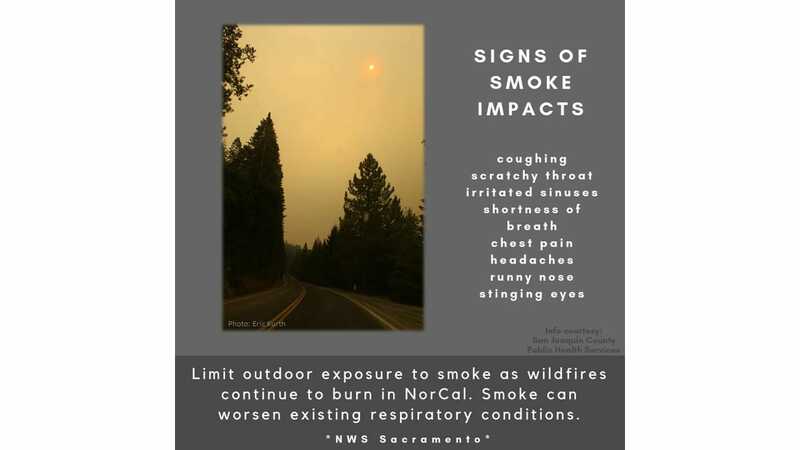 Diminishing winds ease critical fire weather conditions, but widespread smoke from the Camp Fire will continue to impact the area. Short-wave trough weakening as it moves onto the West Coast and flattens the ridge. First batch of high clouds moved through yesterday with another batch now knocking on the door. IR imagery still shows considerable heat emanating from the Camp Fire, particularly the northeast corner of the fire along the Butte/Plumas boundary. With clear skies and dry airmass, current temperatures are running cooler across the region compared to 24 hours ago and range from the upper teens to lower 20s in the colder mountain valleys to the 30s across the Central Valley. Milder thermal belts are in the 40s to lower 50s. Little overall change to the weather pattern expected through the remainder of the week. Poor mixing will keep persistent smoke over a large part of interior NorCal affecting daytime highs. Nevertheless, highs will be around 5-10 degrees above average. Other than some passing high clouds at times, skies will remain cloud- free allowing good radiational cooling. Overnight lows in the Central Valley will locally drop into the lower to mid 30s resulting in some frost in the outlying areas. Upper level ridging is expected to remain over NorCal through early next week with weather conditions remaining mostly unchanged from this week. However, model guidance continues to suggest a pattern change is in the works for next week. With each run, it is looking more likely that an upper level trough will break down the ridging and bring a chance of precipitation to California sometime mid to late next week. As mentioned in previous discussions, the confidence in timing and amounts is still low due to model differences. The Euro model is still bringing the weather system inland by Tuesday evening which is about a day earlier than the GFS. For now, have continued with forecast persistence by bringing precip chances in Tuesday night through Wednesday. 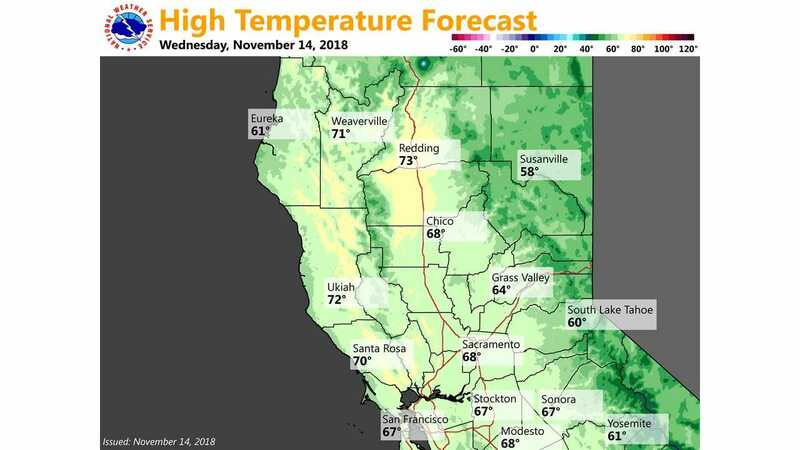 Along with precipitation, temperatures are expected to cool back to seasonal normal as the weather system moves over NorCal.